The truth is that for most commercial and industrial property owners, their roof is “out of sight” and for the most part “out of mind”. Nothing happens until storm damage or leaks occur. 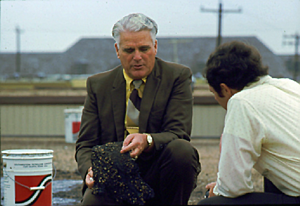 If we let the roof simply wear out without the benefit of a good roof maintenance program, the roof will probably need replacement within 8 to 10 years. But, let’s look at that approach and it’s impact on the total cost of ownership. For our first example, the “just let the roof wear out” example, we’ll be nice and say the owner’s 25,000 square foot roof is going to last for 10 years. And, let’s be even nicer and say the roof performed great until it failed. It never had a leak until it needed replacing. So, the owner of the property buys a roof for $100,000 and spends nothing on it during its lifetime. His cost is only $4.00 per square foot over the 10-year life of the roof or 40 cents per square foot per year. He just buys another roof in 10 years, which in today’s dollars will cost him another $100,000. Hopefully he’ll have the same luck he did with the first roof. Now, let’s take our same example, but let’s say our puts a good roof maintenance program in place with twice yearly inspections. 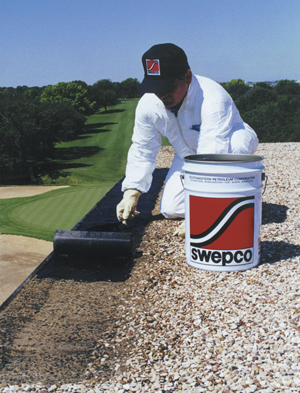 He keeps a few pails of SWEPCO maintenance materials on hand for simple patch and repair type maintenance and when the roof indicates that it needs some more serious attention he contacts his SWEPCO Independent Sales Consultant or Distributor. Through his own good judgment, this owner doubles the life of his roof to 20 years. What is the bottom line? We’ll it’s really more simple than a lot of people try to make it. If this owner spends anything less than $100,000 (in today’s dollars) to double the life of his roof, he has saved money. This means he can spend an average of $5,000 per year maintaining his roof and still not have spent a penny more than he would with the “do nothing” approach. If he spends an average of $1,500 or $2,000 per year he has saved a lot of money. Of course this is a somewhat oversimplified view of the situation. In the real world, that original roof would probably have failed in year number eight instead of year 10 without any maintenance at all. And it would have had leaks along the way which would have cost the owner money to repair. And the insulation would probably have been soaked from the leaks, so its effectiveness would have declined and the owner’s energy bills would have increased. And the leaks would have caused interior damage which would have to be either tolerated or repaired at still more cost. And there is the additional cost of removing the old roof in year ten and disposing of the waste which will increase the replacement cost well above the original cost of $100,000.